It’s just another day of haircuts and manicures at the Shear Madness Salon with your stylist, Tony and manicurist, Barbara. A little mousse, some snipping of hair, a smattering of gossip, a dead body, and lots of hair spray. Wait. What? Yes, you read that right. Someone is murdered and the fun is just about to begin. Bedlam ensues at the salon when someone kills the concert pianist who lives upstairs. There are many suspects. But who killed her? Don’t wait for the script to reveal the culprit—it’s your job to figure out “whodunit” with your fellow audience members. Producer Benjamin Wolfe of the Southeastern Southern Theatre Institute is thrilled to bring the longest-running non-musical play in the USA to the shores of Hilton Head Island. An award-winning comedy, Shear Madness has been seen by more than 57,000 audiences worldwide, and since there are no two performances alike, audience members will want to return to the scene of mayhem more than once! 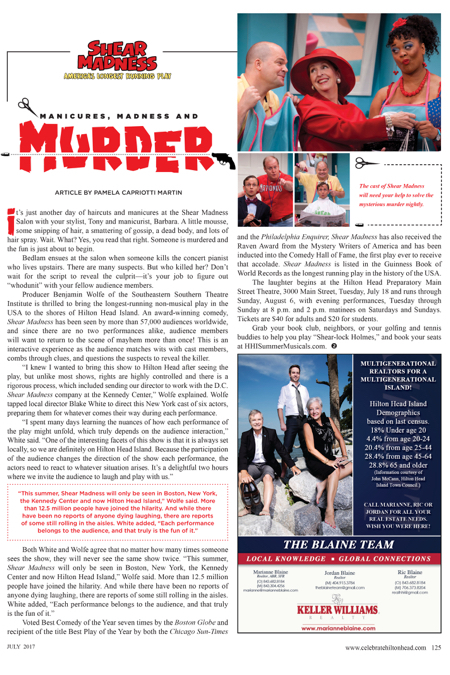 This is an interactive experience as the audience matches wits with cast members, combs through clues, and questions the suspects to reveal the killer. “I knew I wanted to bring this show to Hilton Head after seeing the play, but unlike most shows, rights are highly controlled and there is a rigorous process, which included sending our director to work with the D.C. Shear Madness company at the Kennedy Center,” Wolfe explained. Wolfe tapped local director Blake White to direct this New York cast of six actors, preparing them for whatever comes their way during each performance. Voted Best Comedy of the Year seven times by the Boston Globe and recipient of the title Best Play of the Year by both the Chicago Sun-Times and the Philadelphia Enquirer, Shear Madness has also received the Raven Award from the Mystery Writers of America and has been inducted into the Comedy Hall of Fame, the first play ever to receive that accolade. Shear Madness is listed in the Guinness Book of World Records as the longest running play in the history of the USA. The laughter begins at the Hilton Head Preparatory Main Street Theatre, 3000 Main Street, Tuesday, July 18 and runs through Sunday, August 6, with evening performances, Tuesday through Sunday at 8 p.m. and 2 p.m. matinees on Saturdays and Sundays. Tickets are $40 for adults and $20 for students. Grab your book club, neighbors, or your golfing and tennis buddies to help you play “Shear-lock Holmes,” and book your seats at HHISummerMusicals.com.